Total production was equal to the average of the previous 10 years. 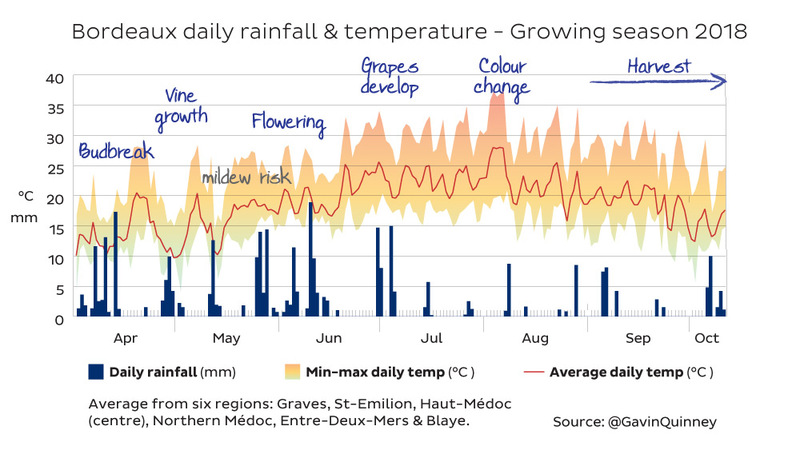 On the Right Bank, Saint-Emilion produced twice the volume of the frost-affected 2017 crop and Pomerol also saw good yields. 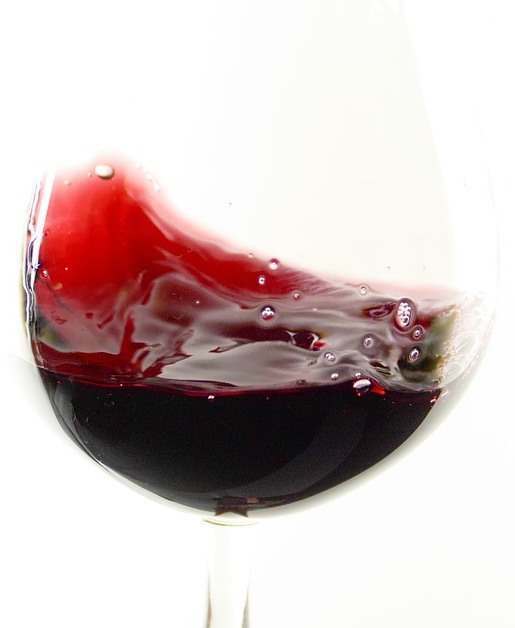 On the Left Bank, Pauillac and Saint-Estèphe produced less than in the previous three vintages. Margaux and Pessac-Léognan made moderately good volumes after a short 2017 crop. Following the wet spring came three months of near-constant sunshine from early July to the first week of October. In the words of Gavin Quinney, “While it was a glorious year for some… for others the size of their crop was the stuff of nightmares.” This was firstly due to downy mildew following the wet spring and secondly to two hailstorms, in May and July. The combination of wet spring weather followed by heat brought strong downy mildew pressure. Some organic and biodynamic estates, including some famous names in Pauillac and Margaux, saw terribly low yields. 26th May – from south to north, hitting the southern end of the Haut-Médoc, before causing significant damage in the vineyards of Bourg and Blaye. 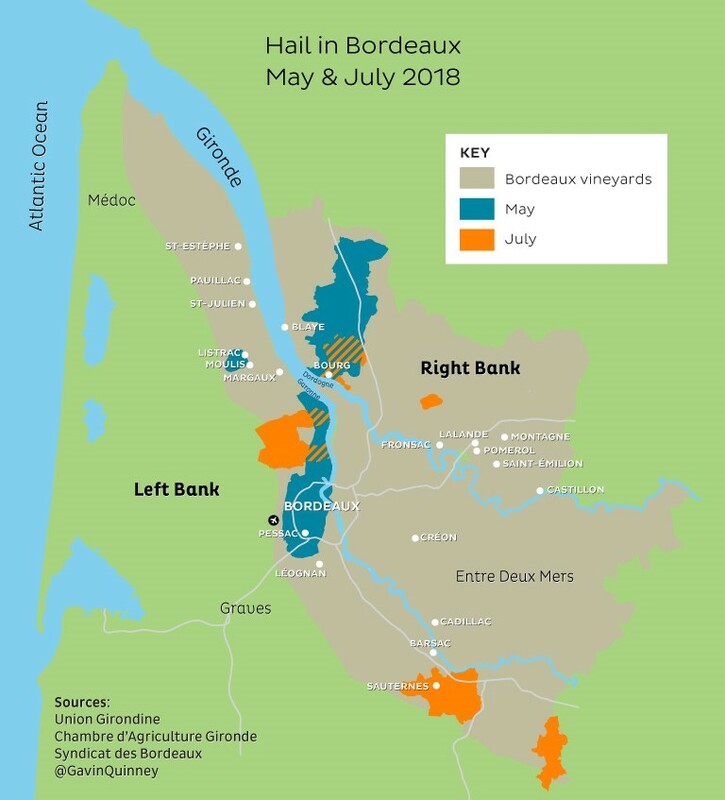 15th July – Sauternes and the southern Haut-Médoc (again). It was dry and sunny for three months from early July through to harvest. June, July, August and September were all considerably warmer in 2018 than the average. There were similarities between the 2016 and 2018 seasons, with a fairly wet first half, then a dry summer and harvest. As Quinney remarks however, in 2016 there was a noticeable change in temperature from 13th September onwards, whilst in 2018, the sun just kept on shining. The grapes were picked in near-ideal conditions, with no risk of rot, from around 21st August for the first dry whites, well into October for Sauternes and the final Cabernets. The grapes had good thick skins, which ensured rich natural phenolics and protected against any harvest rain.